There’s no doubt that weddings have evolved radically over the past generation. These days, a lighting company is frequently among a couple’s team of professionals. In fact, this additional event dimension likely isn’t a trend at all, but a wedding element that’s here to stay. 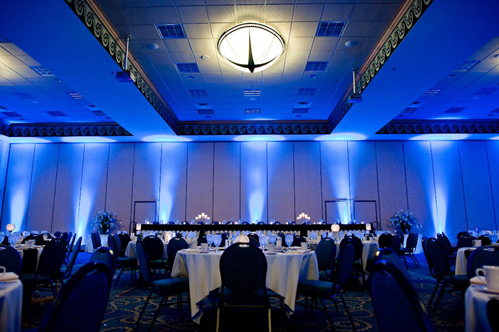 “Uplighting is no doubt the single most visually powerful lighting technique available,” asserts the ACA Music & Entertainment website. Matt Anton, a representative for the Brookfield vendor, adds that it’s been a “hot seller” and is sure to hold its popularity into 2013. 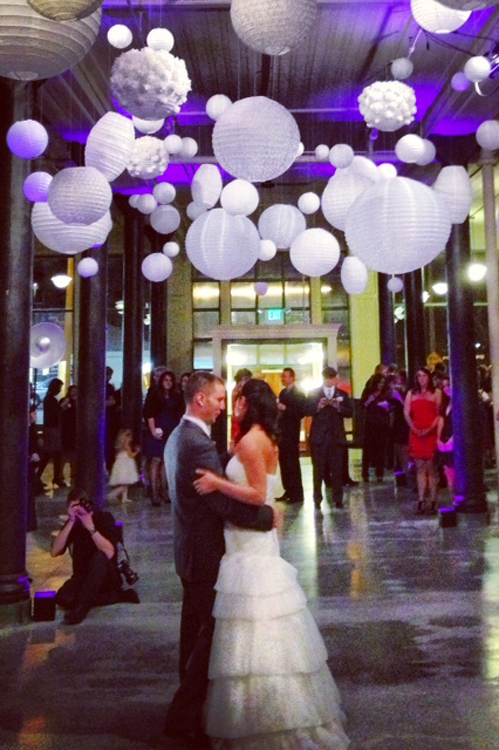 All the lighting experts I spoke with agree, uplighting—illuminating a surface from bottom to top—tops Milwaukeeans’ wedding wish lists for lighting. Though incandescent lights with colored gels are still around, many local lighting pros, including Midwest Sound, use only LED lighting. “It’s the safest, most reliable, most energy-efficient, and most versatile technology available,” says Torkelson.Want to light spaces without access to outlets—tents, trees or outdoor architectural details, for example? “We now offer wireless uplighting!” says Anton. “We use high-powered wireless LED lighting fixtures with computerized DMX controllers to match the colors the buyer chooses.” His company is among a number of local outlets that have the capability, which offers a clean look to any space. Sound By Design in Shorewood is another. “We’re always trying to be ahead of the game,” says David Hackbarth, lighting guru at the 16-year-old family-run company. Their team also illuminates events with downlighting, as well as spotlighting (to highlight focal points), string balls, chandeliers and tree-stand lighting (typically for tents). Not all lighting techs, including Anton, agree. Come in and check it out for yourself, he says. 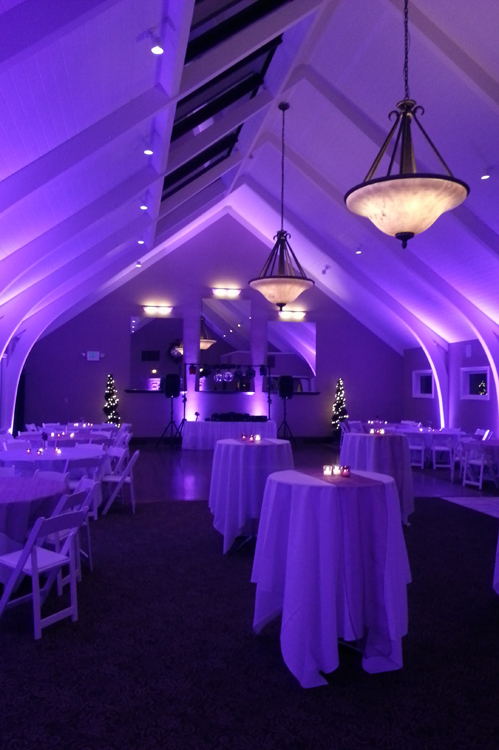 Most of the time, says Torkelson, couples opt for single-color lighting that complements their color scheme. The hot colors of late: purples, blues and greens. Possibilities abound when it comes to color. However, pros say it’s tough to create blacks, browns, deep hues and soft white with LED lights. If soft white is the tone you were hoping for, don’t despair: Next year, Hackbarth says, these bulbs are hitting the market. Don’t worry—you won’t have to forego, say, cake just because your heart is set on some visual ambience. Small uplighting jobs, which involve around five fixtures (enough to illuminate a spot like the head table), start at less than $200 in Southeastern Wisconsin, and some companies even offer the occasional deal. 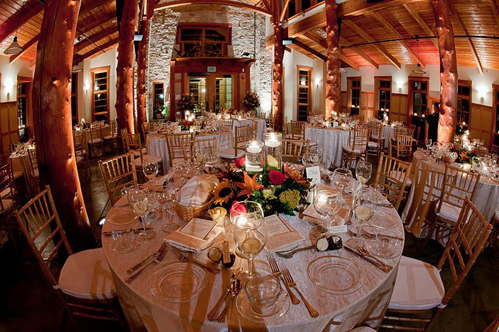 To light a whole banquet space, which takes typically 15 to 20 lights, the cost averages to less than $500. 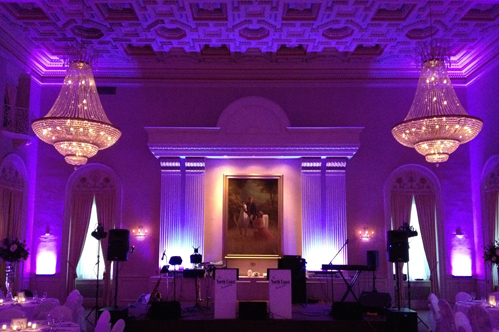 Bonus: If you hire a DJ who also does lighting, brightening up the dance floor is often rolled into the fee. “You’d be surprised at how affordable it can be!” Torkelson says, but adds a few tips to make sure you’re getting your money’s worth: Confirm the pro is using LED lighting (he says incandescent lights with gels get dangerously hot and leech energy), ask how many fixtures are in the quote and the cost of additional ones, and double-check that setup, tear-down and travel are included. Of course, if you want to go beyond that, have at it. “Because of the sheer cost of the gear, it’s very common to see prices range from $500 to over $1,000 for an uplighting project,” says Torkelson, who tells me pros can pay a staggering $300 for a single cutting-edge fixture. Special thanks to John McCarthy of Sound By Design for his assistance on this article.